During yesterday's Tour de France coverage I was relieved to hear Matt Rendell talking about the benefits Chris Froome will have received by riding for Bradley Wiggins. I've been saying for ages that the high placings Froome achieved in the 2011 Vuelta and 2012 Tour had almost as much to do with Wiggo's brains as Froome's legs. I summed up my feelings on Wiggins and Froome's respective skills in this post and while I'll admit that Froome has changed and evolved since then, I still think he owes a lot of that evolution to Wiggo. The ability to ride a clever, savvy race could be vital in the next three weeks. At present, it looks like Froome has the form of his life, while Contador has shown no form at all this year. You can discuss the possible reasons for his loss of form somewhere else, preferably somewhere with less stringent libel laws. Nevertheless, I wouldn't put it past him to have a resurgence: this is the chap who left the beach to win the 2008 Giro on a week's notice. When his form finally comes in, it comes in fast. 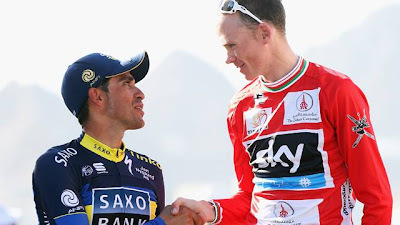 If Contador finds his legs, there's much less to separate him from Froome physically, and it could come down to who has the better racing brain. Froome, similarly, has been prone to misreading races, or just plain not thinking about what he's doing. Prior to 2011 he had a reputation for sitting at the back of groups he should have been at the front of, or for burning energy on fruitless early attacks. Then there's the story from his early days in Kenya, where he supposedly rode 50Km to take part in a 250Km race and wondered why he didn't have enough in the tank to compete. Or that moment in the 2011 Vuelta when the entire peloton was bemused to see him frantically attacking off the front in an attempt to secure the bonification at an intermediate sprint. Unfortunately, the intermediate sprint was a whole kilometre further up the road than Froome had thought. If Contador recovered enough form for them to be physically matched, which would have the racing brain to make the difference? Froome has shown a little cunning on a couple of occasions this season, skipping turns and feigning tiredness before attacking his rivals from behind, most notably here at the Tour of Oman. Thing is, it does seem to be his only trick, and he's used it twice this year already. Contador, on the other hand, spent all of the 2012 Vuelta being unable to beat a rampaging Joaquim Rodriguez on their traditional, late-stage, steep battlegrounds, before doing the unexpected and attacking instead on a medium mountain day, ridiculously early in the stage, when Rodriguez wasn't looking. In the process, he stole the race right out from under a stronger rider. 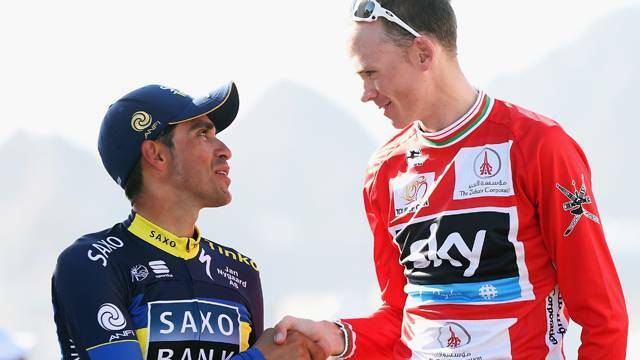 If, and it's a very big if, Contador gets his legs back for this Tour, I reckon he'd be smart enough to nick it off Froome. I sort of hope it does happen. Don't get me wrong, I've stopped holding a grudge against Froome for last year's "Fwooomie-gate", but that doesn't mean I want to see another Tour in which a dominant rider goes almost unchallenged to the victory. If I'm entirely honest, I'd really like to see Cadel Evans win it. His transformation from petulant nearly-man to engaging, gutsy and aggressive World Champ and Tour winner has been one of the most enjoyable parts of being a cycling fan in recent years, and I'd love to see him reap further rewards. Similarly, I'd love to see the huge amount of excitement Rodriguez has generated over the last few years actually net him the top step on a grand tour podium for once. Sadly, I don't think it's particularly likely - the Tour gets ridden so much faster and harder than other GTs that riders who've seemed to be defying the aging process in other races can suddenly look old overnight. I fear that Evans and Purito can hope for a podium spot at best. That means that our best hope for an actual GC battle in this Tour comes from Contador rediscovering his legs and then matching wits with Froome. I hope that happens, and if it does, I'll happily cheer for Froome.